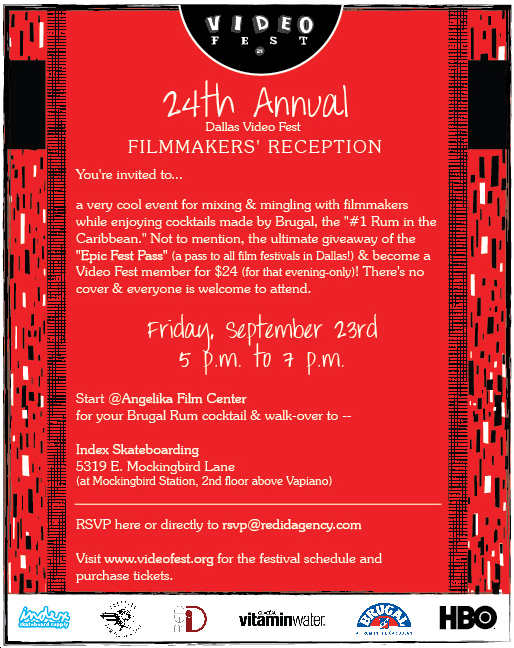 a very cool event for mixing & mingling with filmmakers while enjoying cocktails made by Brugal Rum, the “#1 Rum in the Caribbean.” Not to mention, the ultimate giveaway of the “Epic Fest Pass” (a pass to all film festivals in Dallas!) & become a Video Fest member for $24 (for that evening-only)! There’s no cover & everyone is welcome to attend. From September 21-25, 2011 the Angelika Film Center in Dallas will be hosting four days of short films, narrative features, short and full length documentaries, experimental films and music videos that showcase talents in the video industry from around the world. Many notable guests in past years included Paul Reubens, Steve Allen, Richard Linklater and Terry Gilliam. Hundreds of films from various filmmakers will be showcased and presented this year. Visit www.videofest.org to get all the latest news, updates and information on all the screenings, guests and events planned for the festival fans this year.